We all love our stuff. As we grow older, it’s only natural to accumulate more stuff. Now, consider how much “stuff” is crammed into an older person’s home. Someone who has spent a lifetime collecting mementos, trinkets and other special things may find it difficult to part with their beloved objects when it is finally time to downsize. Aging adults often find it necessary to move to a smaller home due to health concerns and finances. This usually means paring down their possessions; and this can be hard. It is not unusual for the decluttering process to be more stressful than the actual move. Whether you are a senior in need of help parting with your possessions, or you are helping a loved one downsize their home, there are some tips that should be followed in order to make this important life transition as easy as possible. The closets are jammed, the cupboards are stuffed full, and no one wants to go down to the basement. A senior’s home can be crammed full of stuff – years and years worth of stuff. The first place to begin is to get rid of the apparent garbage first. 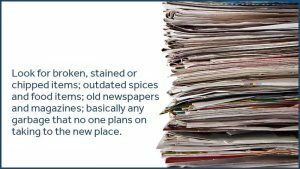 Look for broken, stained or chipped items; outdated spices and food items; old newspapers and magazines; basically any garbage that no one plans on taking to the new place. Once you have cleared away the garbage, the job of downsizing gets harder. A good place to begin is to think of the senior’s “needs.” Will they be hosting large family meals in their new home? If not, that 12-piece china set can probably be given away, sold or even stored. Take only the pieces that will be needed. What about clothes? Consider what is worn regularly and get rid of the rest. The average American gets rid of nearly 100 pounds of clothing a year. If a senior has not been cleaning out their closets regularly, there is a good chance that there are plenty of items that can go. It has been estimated that most people only use about 20 percent of what they own. The trick to downsizing is to pare down to that 20 percent. Once the necessary items have been packed, it is time to consider what the senior wants to take to their new home. Here’s where the decision making part of the process gets more difficult. Many people want to keep all (or most) of their belongings. But practically speaking, if you or someone you love is moving from a 2200 square foot home to a 900 square foot apartment, not everything they treasure is going to fit. Consider the size of the new living space and how much will fit inside it. Maybe you can not imagine living without your four poster bed. If it takes most of space in the new bedroom, you may have to consider giving up your triple dresser. That’s okay. Keep those items you love most. 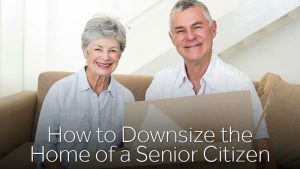 The downsizing process can seem simple at first. But eventually, everyone hits a point where they realize they’re keeping more than they should. This is when it becomes even more important to focus on every item’s value and place in your life. For example, if you plan on sewing a lot once you are settled into your new home, then by all means pack your sewing machine and a reasonable amount of supplies. If not, let it go. Go Digital: scan photos and important documents. That way you can enjoy them all in a small amount of space, while storing the originals offsite. Pack a special box of items that you can’t bear to get rid of, but really don’t need right now. These can be stored while you decide if you can indeed live without them. Use memorabilia to decorate you new home. Instead of taking up shelf space with multiple photo albums, consider turning those old pictures into artwork to grace your walls. Whether you are helping someone downsize, or doing it for yourself, it is important to respect the feelings of those involved. Downsizing a senior’s home is a big change, and the process is delicate. Never force anyone to give up beloved items until they are ready, and be respectful that there are feelings and emotions associated with possessions. Help make the process easier by reinforcing the positive aspects of the move and bringing in the right kind of help to make the move easier on everyone involved. The professional staff at Zippy Shell of Greater Columbus is trained in helping seniors downsize their homes by providing expert advice, storage services and moving aides. For those who want to keep more belongings than will fit in their new space, Zippy Shell offers a unique storage option that is simple, affordable and safe. During the packing process, Zippy Shell delivers an empty storage shell to the home, where it is then filled with the occupant’s belongings. Once filled, the shell is then taken to a climate controlled storage facility where it is kept until needed. Anytime items are needed, the unit can be brought back to the owner and then re-stored. This is a great option for those who can’t part with special possessions, yet don’t have the space to keep them with all of the time. Transitioning to a smaller home isn’t always easy. But, with the right tools, downsizing can create a freer, less stressful lifestyle. Let Zippy Shell help you, and we’ll beat our competitors’ prices by 20 percent!